This Disney Frozen Elsa Baseball Cap was the perfect accessory for my little girls Halloween costume. She wanted “Elsa hair” and what I found out was that what that really meant was that she wanted the long braid. Well, needless to say she got her wish and she loved it. The cap is absolutely adorable and well made and everyone loved it. We did trick-or-treating at the mall and while there were a ton of Anna and Elsa costumes, there were no Elsa caps like this one so my baby girl felt extra special. The cap is now 2 years old and has had to be rebraided a couple of times, but other than that it still looks great. For her dress, I chose this fancy dress/costume from Relibeauty. The dress is absolutely stunning and is incredibly well made for the price. 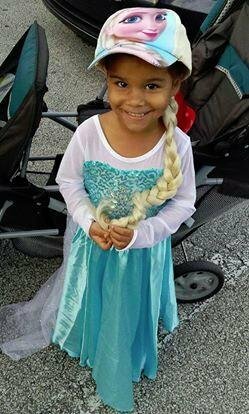 It did not look like a normal Halloween costume and will be able to be worn many more times for dress up play or for Frozen parties. My little girl absolutely loved it!! The dress runs pretty true to size and the fabric is a soft satin and is not itchy at all. My daughter was so comfortable all night long that she didn’t even want to take it off. I can honestly say that I will be buying from this seller again because the quality is unbelievable. I would not have been able to get anything this high quality in the stores and I would have to pay at least twice as much. *This post contains affiliate links however all opinions, thoughts and ideas are entirely my own.